so I am rewinding my review for the hardcover edition. Seeing that kitty on the cover always makes me smile. I can’t believe this it the 8th Cat in the Stacks Mystery. This time we find Charlie running into some people he attended college with. Two he is very happy to see, one he wants to avoid. Knowing the one he wants to avoid is giving a keynote speech means they are going to meet face to face because Charlie’s library is hosting the event. The meeting does not go well but when the man drops dead during his address all eyes turn to Charlie as the prime suspect. Charlie quickly finds out there are several other librarians angry with Mr. Gavin Fong, he just needs to figure out which one permanently checked him out. This is one of my favorite series of all time. I reviewed the first book, Murder Past Due, back in 2010 and absolutely loved it. Each story continues to build on that first one and always draws me in at page 1. Miranda James writes us another excellent mystery this time. One I read all in one sitting. It was like curling up with some old friends. Charlie and his wonderful feline sidekick, Diesel, make a fantastic team and they work together so well in their “purr – suit” to find the guilty party. This time there are so many suspects it was fun to parry them down one by one and even circle back to a few that I had already written off. This Gavin Fong sure rubbed people the wrong way. Charlie also has some things happening in his private life as well. Some great things, some that will take some thought, and one that has him a little worried. Diesel is such a calming presence in his life and one I understand so well myself. This story is the epitome of what a cozy mystery is supposed to be with the exception that our amateur sleuth is a man, but a very lovable man. It is set in a small college town, we have a victim that has plenty of faults, and we are given a great mystery to solve. All the books in this series are outstanding. A Cat-ivating Cozy !! A Purr-fect Escape!! 5 Paws!! What better combination than books and pets in a plot! It sounds like a winner! Great series, can’t wait to read. Diesel and Charlie – what a wonderful pair! Love this series. Thanks for the review. 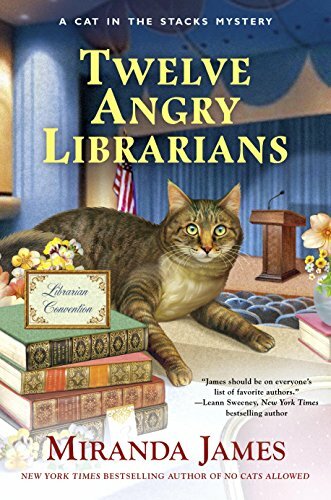 I absolutely love the cover and can’t wait to read “Twelve Angry Librarians” after learning about it.